The astonishing rise of New York Knicks sensation Jeremy Lin has become the biggest story in sports, but some are celebrating in rather iffy ways. Lin's stunning, buzzer-beating, game-winning three-point shot in Toronto on Tuesday night sent the world into another frenzied round of "Linsanity." 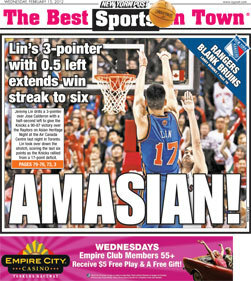 But the New York Post is drawing eyebrows for the headline on its back page sports cover: "AMASIAN!" The headline writers at the Post aren't the first to tread into murky racial waters when it comes to Lin, who has drawn almost as much attention for being Asian as he has for his sports skills. Columnist Jason Whitlock and boxer Floyd Mayweather have both made offensive, race-based comments about Lin (Whitlock later apologized). Some readers took objection to the headline, with MSNBC host Chris Hayes calling it "questionable" and others saying the Post was an "absolute disgrace." People also tweeted that they loved the headline, though, with one calling it the "greatest headline ever." What do you think? Tell us in our poll below.